With the new generation of the small drum headers, leading performance is proven. Due to feed availability pressures, the variety of plants and harvesting conditions becomes more and more challenging. The investment into a special head is expensive. The John Deere small drum head is a good alternative to harvest a variety of crops. The most challenging is the optimization of the crop flow in the header. An open construction was the solution. 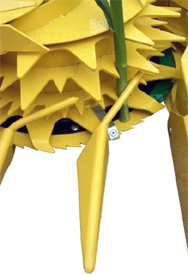 All drum scrapers or holders of divider points are positioned out of the crop flow. An accumulation or blocking of weeds and leaves will be avoided. 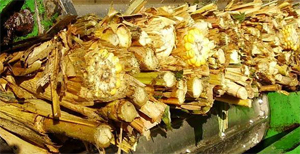 The open design ensures the header is self-cleaning for cleaner silage (Performance). The open design is more reliable because dirt does not build up in the header (Uptime). After the fast-rotating blades cut the plant, the intake fingers push the plant into the gatherer drums that rotate in the same direction at low speeds. Every plant is pushed into the teeth of the gatherer drum. The special-designed shape of the teeth ensures that both small and big plants are conveyed in a secure way. In the machine, the plants are taken off the gatherer drum at the back of the drum by scrapers. Depending on the width of the header, they are forwarded to cross-feed drums or immediately fed into the angled feed drums in the middle of the machine. Every plant is individually and securely pushed into the gatherer drum (Performance). 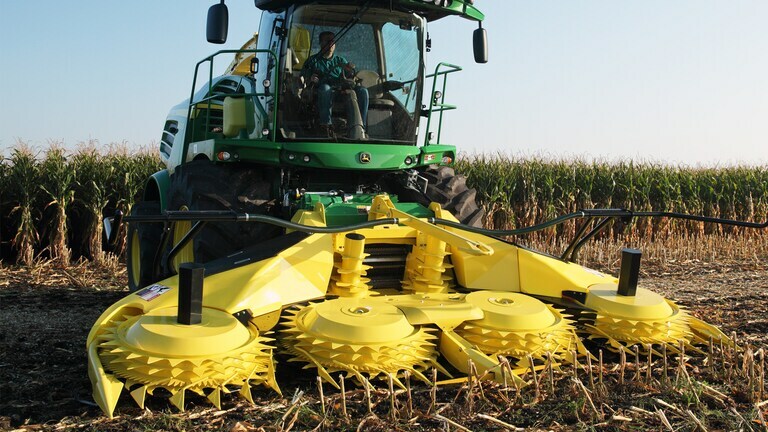 The saw blades of John Deere rotary crop headers cut quickly and thoroughly at a high speed of rotation. As the fast turning blades cut the full width, crops can be harvested regardless of the row spacing. Thanks to this row-independent harvesting technology, the field can be worked from any side, which is particularly important for down crop. 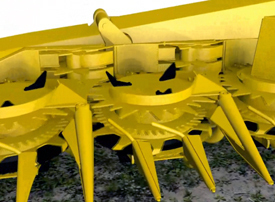 The fast-turning saw blades allow crops with a lot of weeds to be harvested easily. Besides corn, a wide range of crops such as sorghum, whole crop silage, oilseed canola, pampas grass, and miscanthus can be harvested. 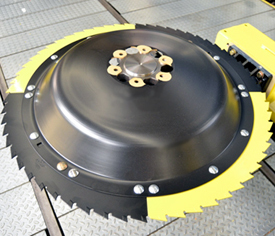 Fast-turning saw blades can cut in difficult harvesting conditions to give the operator increased uptime. Headers can be used in various stemmed crops and there is no need for extra headers, which saves on the cost of operation. Even feeding of the harvested crop bundled lengthwise to the chopper unit of the self-propelled forage harvester (SPFH) is crucial for an even cut. Only even, lengthwise feeding allows for the full use of the power installed on the SPFH. Bundling of lengthwise stalks is the basis for perfect cutting (Performance). Two angled feed drums push the crop toward the feed rolls of the SPFH. 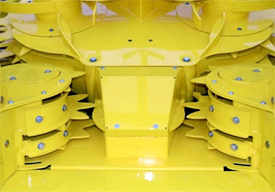 The size of the feed drums depends on the size of the header; the 6- and 8-row headers feature three rings that push the crop in the feed rolls of the SPFH. The 10- and 12-row headers feature a lower version with only two rings. 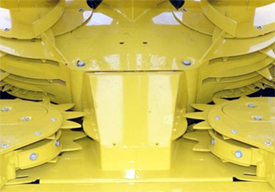 The feeding drum size, depending on the working width, provides the necessary space to use 10- and 12-row headers, which allows for the operator to feed larger crop bundles to the SPFH (Performance).